BILLINGS, Mont.--(BUSINESS WIRE)--More than 6 million new North American households have adopted the camping lifestyle since 2014, with the number of campers who camp three times or more each year – the most avid group of campers – having increased by 64 percent. 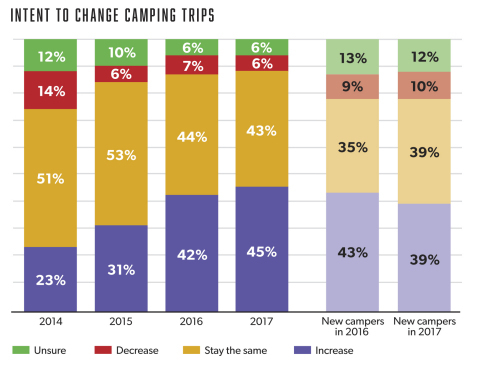 This growth, according to the results of the 2018 North American Camping Report, an annual independent study supported by Kampgrounds of America, Inc. (KOA), is an indicator that camping is fast becoming a lifestyle attribute among U.S. and Canadian households – and there is no indication this trend is slowing down. In the U.S. there was an increase of 2.6 million new camper households in 2017. Further, representation among all ethnicities is beginning to appear more like the overall population. Building on 2017 report findings, campers at all experience levels and among all ethnicities continue to express the desire to camp more and are equally likely to say they intend to increase their camping trips in 2018: 45 percent of all campers indicated they will increase camping trips in 2018, an increase of 3 percent from last year’s report, while 39 percent of new campers in 2017 will increase camping trips in 2018. Increases in camping – both in reach and frequency – can be tied to increased accessibility of camping due to the removal of previously held beliefs and barriers. While previous research demonstrated bugs, safety/security and/or campers not knowing anyone who camped as primary barriers to camping, those barriers are waning with technology and social media serving as access portals to helpful information both prior to and during the camping experience. Further, according to campers who say access to cell or Wi-Fi service has a great deal of impact on the length of their trips, they are able to take almost a full week extra of time camping. The 2018 North American Camping Report continues to show campers view camping as a time to relax, escape stress and clear their minds. Even with an influx of new campers (both younger and more ethnically diverse), differences in opinion about the reasons for camping are beginning to lessen, with close to half of all campers suggesting that camping has “a great deal of impact” on reducing stress and allowing them to spend more time with their families. There is also increased recognition that camping contributes to emotional and physical health. Forty-five percent of all campers indicated they will increase camping trips in 2018, while 39 percent of new campers in 2017 will increase camping trips in 2018. As first noted last year, teen campers continue to be highly engaged in camping and demonstrate a great deal of enthusiasm toward camping and the outdoors. Teen campers express higher levels of enthusiasm toward camping than what adults predict; 94 percent of teens state they are enthusiastic about camping, compared to 77 percent of adults who say that teens are enthusiastic. Nearly all of the teen campers surveyed claim they intend to camp as adults, and if they have children, they intend to bring them camping. In fact, most teen campers identify a benefit of camping as relaxing the adults in their lives (as well as themselves). Further, new campers in 2017 are more diverse than the overall population with a nearly even split between white and non-white campers. Those who serve the outdoor hospitality sector should plan on higher levels of camping across the board, but primarily among younger campers who may drive the camping economy as they experiment with different types of accommodations and camping. Six out of every ten millennial households tried some type of camping or lodging in 2017, but the experimenting is being driven by Hispanics (71 percent) and African Americans (78 percent) trying out new ways of camping. Nearly all millennials (93 percent) and Gen Xers (93 percent) would like to try some type of new camping in 2018. Millennials are the most likely to want to experience backcountry camping and/or glamping, while Gen Xers seek unique accommodations. Both millennials (66 percent) and Gen Xers (58 percent) are changing their camping habits and included both more weekends and weekdays in their trips this past year. A past determinant of camping has been not having access to information about some of the issues that may have hindered camping in the past, such as safety and security. These issues can now be addressed with social media networks and searching the internet, putting information at the prospective camper’s fingertips. Nearly all campers (97 percent) state that they bring some type of technology with them while camping. 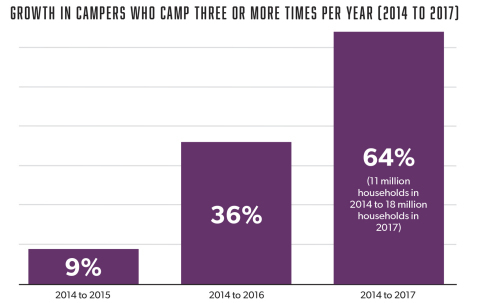 In a continued upward trend since 2014, campers are significantly more likely to go online while camping. Yet, in departure from the results observed last year, campers are significantly more likely to say that the use of technology detracts from the overall enjoyment of their camping experiences (38 percent in 2016, 49 percent in 2017). What’s more, the idea of “unplugging” while camping is in fact unlikely to mean a complete disconnect from technology. About a third of all campers say they have their smartphone with them, but they don’t turn it on (used for safety only). The use of social media to share photos and videos while camping continues to grow, with 27 of millennials and 25 percent Gen X campers saying that sharing camping experiences through social media is important (compared to 24 percent of all campers). Millennial families are more likely than other millennials to post a status update via social media (40 percent), check-in (40 percent) and share photos or videos (68 percent) while camping. Tent usage remains consistent and the highest camping accommodation with 61 percent of campers identifying tents as their primary way of camping; about one-fourth (24 percent) of all campers use an RV as their primary way of camping. A full one-fourth of this subset of campers say they borrow the RV, and 1-in-5 say they rent from a company or peer-to-peer rental service. Borrowing an RV is most common among Gen Xers. U.S. and Canadian Household Results: This survey was conducted by Cairn Consulting Group, an independent market research firm with extensive experience in the hospitality and services industries. The survey was conducted in January 2018. The sampling methodology targeted a randomly selected sample of U.S. and Canadian households. Sampling was designed to obtain n=2,903 completed survey among representative U.S. households and representative Canadian households. A sample of n=2,402 U.S. households is associated with a margin of error of +/- 1.99 percent. Among Canadian households, a sample of n=501 is associated with a margin of error of +/- 4.37 percent. Teen Survey Results: The results are based on a total of 403 surveys completed among a random sample of U.S. households with children between the ages of 13 and 17. Each survey was completed with a teen respondent whose parents gave prior permission. A sample of n=403 teen campers is associated with a margin of error of +/- 4.9 percent. All surveys were completed online via an outbound solicitation sent to a randomly selected cross-section of U.S. and Canadian households. The sample of households from which the surveys were completed was statistically balanced to ensure that the results are in line with overall population figures for age, gender and ethnicity. Kampgrounds of America, Inc. (KOA) is the world’s largest system of open-to-the-public campgrounds with more than 500 locations across the U.S. and Canada. The industry leader in outdoor hospitality, KOA’s family of campground brands – KOA Journey, KOA Holiday and KOA Resort – offer sites and amenities designed for every type of camping experience. The company was founded 55 years ago in Billings, Mont., and today serves more than a million camping families each year, who rely on the standards of excellence and unique outdoor adventures KOA is known for. For more information, visit KOA.com and KOApressroom.com. Survey findings from the 2018 North American Camping Report reveal insights into camping trends and forecasts for the upcoming season.